A Music-related blog containing information and commentary of my favorite music, as well as some choice downloads of quality, hard-to-find music (unofficial releases, ROIO's, concert bootlegs, etc.) available on the web. For many years, this was considered the holy grail of Steely Dan bootlegs, as it features a complete alternative Gaucho album including several unreleased songs from the Gaucho sessions that were not included on the eventual album. 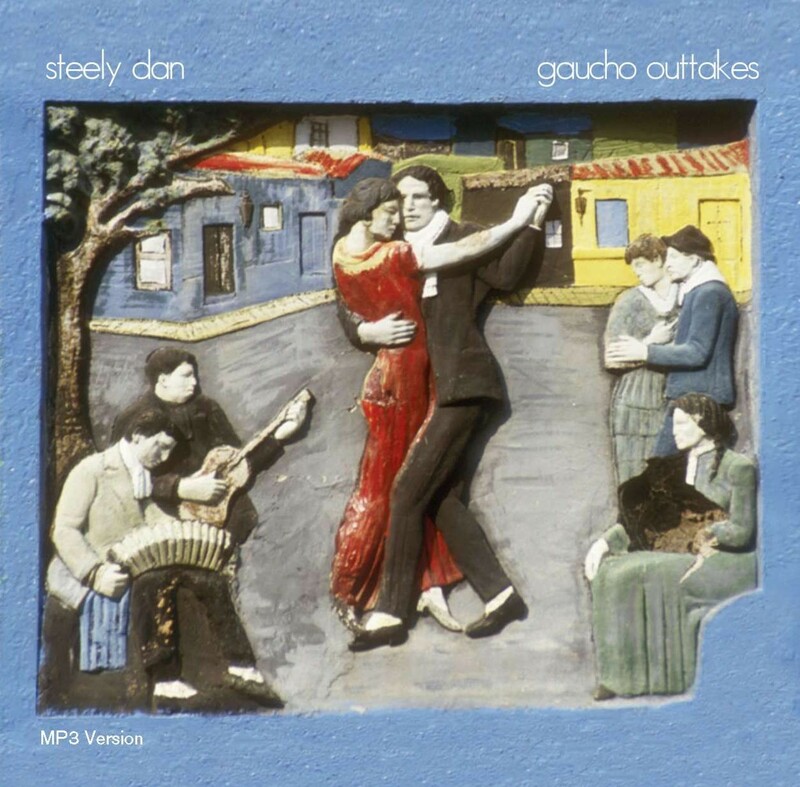 As is known by most SD fans, Becker and Fagen had to endure various misfortunes during the long and grueling process of the making of Gaucho, which caused numerous delays in its release. Becker was hit by a car, one of their favorite new tracks "The Second Arrangement" was accidentally erased by an assistant recording engineer, and there was a dispute over which record company had the rights to their forthcoming album. MCA won the contract dispute (although Fagen and Becker had already signed to a new label, WB) but then decided to increase the album's list price to one dollar more than all other albums at that time. Donald and Walter tried unsuccessfully to fight the price increase. Through all this, Fagen and Becker grew more and more disenchanted, and eventually scrapped much of what had been recorded previously, including several entire songs. Gaucho was eventually released in November, 1980. But the ordeal, poitics, and aftermath of the making and remaking of Gaucho may have lead to Donald & Walter's decision to call it quits after this album. Nonetheless, these outtakes represent all that is left from these sessions and the last unreleased songs from Steely Dan. This outtake collection, consists of the 'Lost' Gaucho album (CD1), which is a complete album vastly different to what was released, as well as a collection of other miscellaneous outtakes, demos, and alternate versions from these sessions (CD2). Of the 8 songs included on the 'lost' edition, only three of these were tracks that appeared on the official album, in somewhat different form. 'Were You Blind That Day' was an early rendition of a song with different lyrics that finally appeared as 'Third World Man' on the released Gaucho. 'Time Out Of Mind' on the lost version is simpler, missing the embellishments added on the Gaucho version. And the title track here is just an instrumental. The rest of the tracks are original unreleased Steely Dan songs prepared for Gaucho, but not used. These include 'Kind Spirit', 'The Bear', 'The Second Arrangement', 'Talkin’ About My Home' and 'Kulee Baba', and have never been released in any form. Earlier versions of these songs circulated somewhat in poorer quality (but were difficult to find) until around 2002 when high quality copies of the sessions emerged. Although these sessions have become fairly widely availble in the last few years, I also wanted to include them here as well, for completeness. Yes! Thanks for the awesome outtakes! Thanks love Everything Steely Dan, been looking for AJA Outtakes and various other stuff like that. Already have Katy Lied and Royal Scam outtakes and want more! Anybody know where to find? Does anyone know the rar password to ynrar these files? Thanks for the Steely Dan updates. Brilliant, been looking for a decent quality a long time. @Sam, so far the only other outtakes I've found are Runnin' Child which was left off Can't buy a Thrill, stand by the seawall was a demo from the aja sessions, the bear included in this set was also an out take from aja. Theres a record plant demo of Any major dude on youtube. Theres some tracks they've only done live if thats your thing, This All too Mobile Home, Cash Only Island. Some single only tracks they released include Dallas/Sail the Waterway and Here at the Western World and F.M. There is a whole collection of demos released as Becker and Fagen that can be found using that name (Catalyst is your best bet if you want that collection as its the most exhaustive set) as well as the soundtrack to a lost movie "You've gotta walk it like you talk it" the soundtrack is available. grabbed this years ago and only just got round to properly listening. omg... kind spirit, the bear, 2nd arrangement, talking about my home, cant write home about you, and kulee baba have to be 6 of the best SD songs ever. genius... cant believe these were left on the cutting room floor! This site respects and supports artists and artist rights. Please support the artists by purchasing their officially released music through normal channels. The music files, information, and downloads linked here represent unreleased recordings that are not available through any official channels. This music is meant to supplement (and not replace) the currently available official releases for fans that want to explore deeper into an artists repertoire than is possible through official releases only (through demos, outtakes, alternate versions, and concert recordings). The music linked here is presented for sampling and evaluation purposes. By all means, if you enjoy the music from any artists represented here, please buy their official releases. All music files linked here are freely available elsewhere on the internet and no music files are stored at this site. I hope you find new music to enjoy here. If any artists or representatives of the artists object to anything I have posted here, please send me an email (address below) letting me know and I will promptly remove it (I only request that you contact me directly rather than pursuing any DMCA notification or legal action). If anyone has any other questions, comments, or information you would like to send me or the blog via email, here is the address. Of course, for comments directly related to particular posts, please use the individual post comments (and I would love to get more comments on the posts, not just to get thanks, but to get more feedback on just what people think about the various music offered here). But if there are other things not related to specific posts, or that you don't want available for all to see, by all means send an email to the blog. If anyone has or knows where I can get access to these ROIO recordings, please let me know. Fabulous Poodles - The Bottom Line, New York NY Feb. 14, 1979 , or any other live Fabulous Poodles recordings.